Let The Big A Grillehouse host your next event! Our Private Event Rooms are available for your next special occasion, be it family, social or business. Please call for sample menus, pricing and details (570) 223-1700. We look forward to working closely with you to create the perfect menu for your occasion and your budget. Our wide ranging menu has something for everyone. Our Sunset Room and Fountain Room overlook our half-acre pond. The large windows and adjoining outdoor deck give the rooms a bright, airy feel during the day—a great setting for a business luncheon. At night, the rooms give off a more romantic atmosphere, which is perfect for intimate celebrations. Each room seats from fifteen to thirty-five guests. For a cozy, family feel, check out our Grand Room. Our warmly furnished double dining room seats from forty to eighty people. It’s ideal for bridal and baby showers, graduations, and anniversary parties. For larger gatherings our Banquet Room, with its high ceilings, antique white interior, raised wood paneled walls and seating capacity up to 90 guests, is the perfect choice. 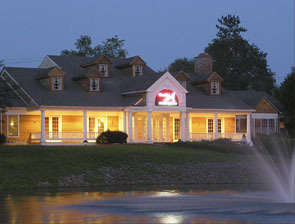 Accommodates such occasions as weddings, holiday business parties and reunions (just to name a few!) Also available for extended needs, adjoining rooms and a beautifully landscaped red brick courtyard —a charming setting for outside ceremonies or just mingling. A private bar with bartender; we can do it! Live entertainment and DJ services can be obtained locally, restrictions apply. Don’t forget our Open Bar and Beer & Wine Packages are available for any occasion!